One recent event that undoubtedly caused a great sensation in the yachting sector concerns Massimo Perotti. After a long time with the Azimut/Benetti Group, where he was appreciated for his indubitable professional qualities, in 2004 he took over the San Lorenzo brand together with Roberto Zambrini, another top manager from Saim. They bought it from Giovanni Iannetti, the yard's deus ex machina, responsible for its history and glory. It is a purposefully slow changing of hands since Iannetti, over and above his post of Honorary Chairman, is still one of the figures in the yard to whom Perotti pays most attention, precisely to underline the continuity between past and future: in their way of building boats, in the aesthetics thereof, the small numbers produced and in the yard's way of relating to customers etc..
On 23rd September 2005 in Monte Carlo, at the Monaco Yacht Show, during a press conference at the prestigious Yacht Club, the desire for this continuity was wholly confirmed directly by Perotti himself. Together with current San Lorenzo General Manager Zambrini, Marco Viti (who has been with the yard for fifteen years) and Antonio Santella, already an outstanding manager with companies like Uniesse and Baglietto, he presented the new course the brand will be taking. Among other things, Perotti said: Giovanni Iannetti succeeded in giving our company the precise connotation of a "top brand" boatyard, perceived as such by customers not only because of its ability to produce luxury boats, as many other yards do, but because these boats are held to be truly exclusive in virtue of their level of customisation to the owners' requirements. Our plus is, and will remain, the care for detail typical of craftwork, linked to the best technologies in such a way as to reproduce on board a level of well-being absolutely in line with the level each of us experiences at home. Our aim is to leave these values unaltered, confirming the brand's positioning as unique of its kind. Perotti continued: San Lorenzo S.p.A. is a company facing a difficult challenge, but thanks precisely to this cohesive, enthusiastic and extremely qualified work group, we count on winning. A turnover of one hundred million is the target to be achieved over the next three years through constant growth not so much in the number of vessels as in widening of the range. Most importantly San Lorenzo, as well as expanding its current base in Ameglia, will be returning after forty years to build boats in the heart of the Italian yachting centre par excellence: Viareggio. This will mean significant growth in the yard's production potential, amply justified by the brand's entry into the sector of large semi-displacement boats in VTR, but also in the aluminium and steel construction sector for planing and semi- displacement hulls up to a maximum length of 50 metres. And then new items in the planing motoryacht sector, the range that determined San Lorenzo's success where, after the recent launchings of the 108' and the 82' and the restyling of the 88', we shall see the debut of a wholly new 62' model, a brand access boat, as well as a restyling of the 72'. One of San Lorenzo's added values is that it has always renewed its boats at very long intervals, and this has been a determining factor in holding their prices on the used boat market. When a customer buys a San Lorenzo motoryacht he knows that a new version won't be coming out in 3 years with consequent devaluation of the one he's just bought. Clearly this gives satisfaction as an investment but also reinforces his feeling of owning an exclusive, absolutely non-commercial vessel. Viti added: Then there are other factors that contribute to our precise positioning on the excellence market, such as the design of our motoryachts which are never over-evolved, classic if anything, timeless yachts. Indubitably the models presented - which moreover concern boats already in production - with their forms fine-tuned by traditional partner Della Role Studio of Viareggio, are absolutely coherent with the family feeling expressed by the most recent models in the range. Similarly unaltered is the level of absolute customisation available for the interiors of every San Lorenzo yacht, even the smallest. 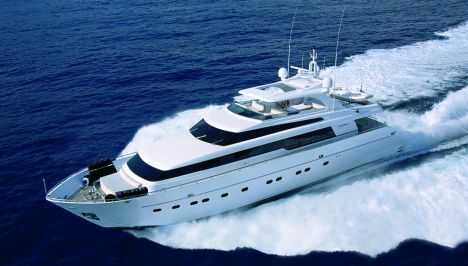 The new 62', like the many other new vessels offered in just a few months (although the "launches" coincided with Perotti's taking over the company helm, the process of range renewal had already been begun by Iannetti) also demonstrates just how much San Lorenzo S.p.A. still believes in the luxury flying bridge sector, notwithstanding the fact that at the same time it is extending into the larger superyacht market which today seems to be increasingly attractive in many ways. A production therefore that will continue to feature high overall quality and, once under way, will undergo acceleration wholly relative in terms of figures but will see precisely the 62' as the model most produced. The floor was then given to Antonio Santella who illustrated the production premises in Viareggio which he will head - two great sheds in the pulsating heart of the town - and above all the first new boats they'll be building. The first bears the acronym SD92, being a semi-displacement 92 footer in VTR. Santella pointed out that here, as in the case of the other superyacht presented at the press conference (the 40 metre ALU), great emphasis was given precisely to the hull designs which he himself defined as ".timeless classics. The work done with the designer of both vessels, Francesco Paszkowski," who often collaborated with Santella in his Baglietto days, "was very intense and driven by the same desire to offer boats whose essence was unmistakeably that of San Lorenzo, while elaborating aesthetic-functional solutions that give them great personality." So the SD92, 27.50 metres long with a 6.80 metre beam, powered by 2 Caterpillars of 1.015 HP, has a line which in certain ways is similar to that of the great San Lorenzo fly motoryachts, though this vessel has decidedly more extensive volumes and areas. The upper deck is emblematic, an actual sundeck, really vast and inviting for sunbathing enthusiasts, but also partly protected by a hardtop on which soars a very classic wooden mast. Also interesting are the insertion that follows the glazing of the pilothouse, streamlining the upright, and the great French window amidships on the main deck that gives access to the galley and its dinette. Added Santella: We greatly believe in the semi-displacement sector because the vessel has outstanding sea-kindly qualities. It's a quiet, long range vessel that can be sailed at night and meets the needs of the real enthusiast. Even people who are now in sailboats, big sailboats, will certainly be attracted by these vessels of ours. The 40 metre ALU then is a superyacht in aluminium with an 8 metre beam, powered by 2 MTU of 3.700 HP. The yacht is undoubtedly eye- catching, first of all for the unusual contrasting colour of the hardtop with its highly aerodynamic sort of radar arch. Then, taking a closer look, for several other interesting stylistic and functional inspirations. In fact for this yacht Paszkowski employed a solution halfway between what is called wide body, with a broad deckhouse - this is how the boat appears forward, giving greater space to the owner's quarters - and the classic motoryacht with a narrower deckhouse which allows for an external gangway, as in fact the boat is aft. In order to maintain unaltered accessibility from the forward deck towards the stern and vice- versa, the Tuscan designer similarly inserted gangways which, precisely amidships, rise and follow the outline of the hull then descend forward. Part of the design effort, both with this 40 metre and the smaller vessel, was aimed at increasing enjoyment of the sea by those aboard, giving the sensation of being all the closer to it. The extensive glazing designed for the SD92 comes under this heading but also, for example, the actual terrace on the sea that can be enjoyed by the owner of the 40 metre ALU, directly accessible from the owner's area and obtained thanks to a 90° overturning of the washboard. After Roberto Zambrini, who will be coordinating and managing the two production premises at Ameglia and Viareggio, Massimo Perotti once more took the floor, introducing Tom Carroll, managing director of the newly established Viking Custom Yachts Inc. which represents San Lorenzo in the USA. This is a partner created ad hoc by Viking Yachts - a leader in the convertible sector - with a mandate to sell San Lorenzo to the Americans, opening up a new and important market for the yard. If the company had a limitation it was precisely that of concentrating its flourishing business almost exclusively in Italy. A partner who should also educate that "mass" market in the pleasure of owning the quality of an Italian motoryacht, tailor-made as they would say. A pleasure, in the case of San Lorenzo, which will continue to be really for the few.